Pikant was the first winner of the Lake Ontario 5.5 metre Championships. Representing the Port Credit Yacht Club and helmed by J. Beatson, she won the Kelman Trophy in 1956. Gordon Laco from Midland, Ontario reports: "...She went to the Toronto Sailing and Canoe Club, where she was raced for many years. I saw her last in 1979 in rough shape -she was still owned by the orginal Canadian owner..."
Names Gordon mentions are Collett and Beatson. Gordon would be interested to find if the boat is still around. Anyone having info on her history since 1979, please comment. "Pikant" shows up with IYC data, hence the export assumption is confirmed. 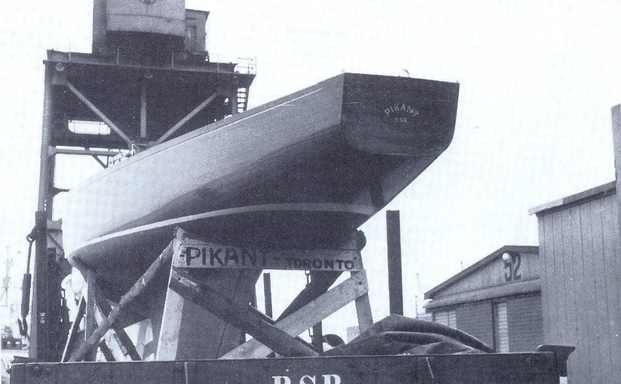 In a Danish book on pleasure sailboats it is stated that "Pikant" was sold to the USA; however,the respective picture shows "Pikant - Toronto". Anyone knowing where she finally went?